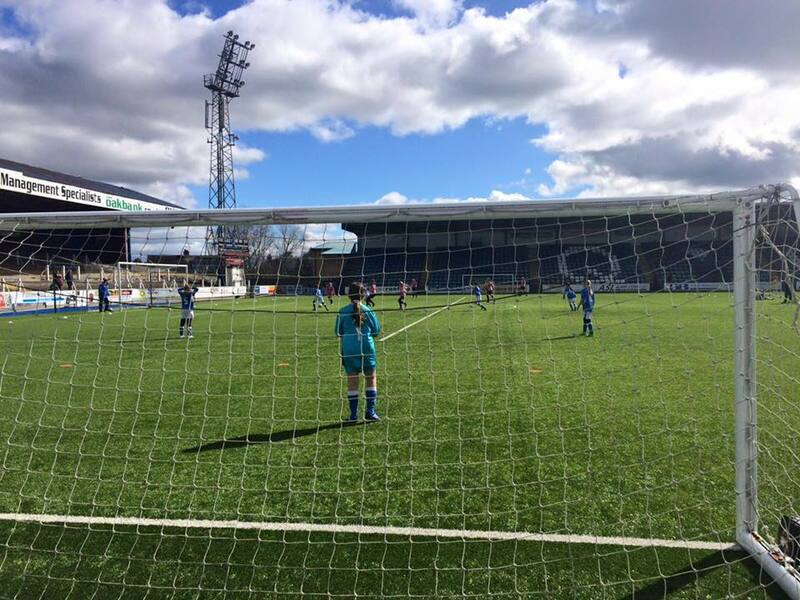 Queen of the South U13 Girls travelled to Airdrie for a Scottish Youth Cup fixture against Gartcairn Whites. With a strong wind behind them, Gartcairn started brightly, putting together some impressive attacking moves. Queens tried to get a foothold in the game, but were restricted by an effective defence to long range efforts. Kiera in goals for Queens entertained and enthralled both sets of supporters with some acrobatic saves and her customary crowd pleasing antics. The game settled down into an entertaining bonanza of attacking football, lacking only goals due to the excellence of both defences and goalkeepers. At full time, the game remained goal-less. The teams still couldn't be separate after extra time so it was down to penalties, a new experience for the Queens girls. With no shortage of volunteers the final penalty taker was decided by a quick game of Rock Paper Scissors! After a rollercoaster of emotions, Gartcairn won the shoot out, two - one. It was a very tough way to go out of the cup, but once again the girls impressed everybody with their fantastic attitude, hard work and team spirit. Meanwhile, Queens U15 Blues headed along the A75 to the Cleyhole on Sunday to take on Millennium in a lunch-time kick off in the league. The game had been in doubt due to heavy rainfall but the pitch passed an early morning inspection. Queens were slow to start and Millennium looked dangerous on the break in the opening stages. However Queens started to take control and opened the scoring on ten minutes when Holly Ovens picked up the ball wide on the left, beat a defender and shot high into the far corner. The opening goal settled Queens, who started to create chances, with Holly going close on another two occasions. Queens doubled their lead in the 27th minute when a clearance by the Millennium defence fell to Cairn Houliston just inside the box, and her first time strike flew high into the net. Four minutes later a neat Maisie Copland close range strike made it three - nil to Queens. The second half saw Queens start well, but they were unable to add to the three first half goals, and Millennium started to come more into the game. A mix up in the Queens defence allowed Millennium to pull a goal back. However in the last minute of the game Rebecca McLellan raced through to beat the keeper with a one on one and seal the win for Queens. The four - one victory, keeps Queens 100% league record intact. This weekend, Queens U15 Blues welcome Kilwinning to Dumfries for match day four on Saturday. Venue and kick off time to be confirmed.